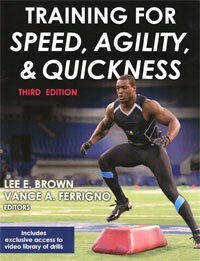 Training for Speed, Agility, & Quickness, 3rd ed. Training for Speed, Agility, and Quickness, 3rd ed. is an excellent resource for trainers, coaches, and serious athletes. The first 2 editions sold more than 100,000 copies. • Lee Brown, EdD, CSCS, FNSCA, FACSM is an accomplished coach and training expert. Dr. Brown earned a masters in exercise science and doctorate in educational leadership both from Florida Atlantic University. Formerly a high school physical education teacher and coach of many sports, he is now Professor of Strength and Conditioning at Cal State Fullerton. In addition, Dr. Brown was the president of the National Strength and Conditioning Association (NSCA). • Vance Ferrigno, BS, CSCS, FAFS is also an accomplished coach and training expert. He earned his BS in exercise science from Florida State University and is a Fellow of Applied Functional Science from the Gray Institute. He holds numerous exercise/fitness/training certifications including the Health Fitness Specialist from ACSM and Certified Strength and Conditioning Specialist from NSCA. In general, this 3rd edition of Training for Speed, Agility, and Quickness is not as much a book to "read" as it is a reference resource. It is loaded with specific drills: 60 speed drills, 113 agility drills, and 87 quickness drills... a total of 260. Almost all of them include black-and-white photos of athletes demonstrating how to perform the drill. There is a nice table listing these drills at the beginning of the book. Part I makes up the bulk of this book: 252 pages. The majority of this section is represented by the 260 drills: pages 37-252. The first 37 pages are explanatory content. Here, the authors explain the concepts underlying the training. Every chapter is supported with several references back to the original research. Part II offers short chapters on 14 sports. 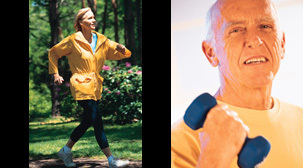 Here, the authors present specific training programs for each sport. • Photos & Illustrations: Most of the drills include black-and-white photos. These are generally well done, though, in several, it's a little challenging to determine the actual movement. Human Kinetics reports that these drills are also available in an online library. There are lots of diagrams of cone-running drills. These are well done. • Tables & Graphs: The table at the beginning of the book listing all of the 260 drills is well done. In Part II, the tables of training programs for specific sports are very useful, though it would be helpful to include the name of the sport at the top of each of these tables. • Documentation / Accuracy: This is not a scientific book, though several research citations are listed for each chapter at the end of the book. What I Liked About This Book: This book is solid, concise, clear, and comprehensive. What Could Be Better: It has very few flaws. About the only thing that could be better would be if the name of the specific sport was included at the top of each table of training programs in Part II. I could see where a coach would want to photocopy these pages but then be confused which page was for football and which page was for baseball. In summary, the 3rd edition of Training for Speed, Agility, and Quickness is an excellent resource. It delivers exactly what the title states. If you are a coach or trainer or serious athlete, this book deserves to be in your personal library. I can recommend it highly.